Can scientific knowledge on the bowel movements of whales help to address climate change? As the history of the whaling debate shows, there are risks to simplistic narratives. Recent scientific research on marine mammals has created a growing body of knowledge about whale toilet habits. Simplifying greatly, whale movement between the depths of the ocean (where they feed) and the surface (where they excrete) has many positive environmental effects, such as recycling nutrients within various ecosystems. One of the benefits of this “whale pump” movement is to the ocean’s nitrogen cycle and consequently to climate change mitigation. This beautiful video by the Sustainable Human, narrated by George Monbiot (who has also written about it), explains the case well. However, in linking climate change to whale conservation (and implicitly whaling) there is a risk of oversimplification around both issues. Anyone who has had a vague interest in the international whaling ‘debate’, if an endless deadlock can be considered a debate, will be aware of how any science around whales is heavily politicised. For example, the video above mentions Japanese scientific claims that whales are overfishing. Yet, an American marine biologist who I interviewed found such an argument laughable, considering it was simply another excuse to try to get around the international moratorium on whaling. Another example of how this video reproduces the use of science within whaling politics is the manner it describes “whales” as a collective, contributing to what Norwegian anthropologist Arne Kalland has called the superwhale narrative. Within this narrative, “whales” are portrayed as biologically, ecologically, culturally, and symbolically special to fit a political argument against whaling and for alternative forms of exploitation, such as whale-watching. As a result, the diversity of the approximately 75 species of cetaceans (whales, dolphins and porpoises) is suppressed in favour of a depiction combining traits of particular species. The superwhale is thus understood as the largest animal on earth (like the blue whale), being able to sing (like the humpback), and to be social (like dolphins), intelligent and friendly. This construct has homogenised conservation threats to different species, with whaling continuing to loom large in the popular consciousness. In this video only humpback whales appear. Humpbacks are one of the more popular representations of the superwhale, with their regular migratory patterns, and breaching and singing habits. In using this narrative, the video for instance suggests that all “whales” contribute equally to the positive trophic cascade caused by “whale pump”. However, this seems unlikely as not all whales dive equally deeply or regularly. It is thereby possible that some species fix more nitrogen than others. Also in this video there is little discussion of on-going threats to whales. The largely historic threat of whaling is mentioned, as are the allegedly spurious claims of Japanese scientists. The impression that one gets is that whaling is still the main threat to all cetacean species. However, it has been argued that the unproductive deadlock around whaling is frustrating any attempts to deal with other issues pertaining to whale conservation. During my research on the relationships between whaling and science it has not been uncommon for scientists to express frustration that other threats to marine mammals, such as fishing by-catch, are not given greater prominence in international fora. By orienting political discussion towards historical rather than current threats to whale species, a diverse series of activities practiced in different parts of the world relevant to whale conservation are hidden. Within this video, an enjoyable ‘infotainment’ format arguably simplifies complex issues, moving attention away from necessary political debates on marine governance. The obvious conclusion one draws from the video is ‘stop killing whales’ rather than ‘change modern lifestyles’. Attention is in consequence potentially moved away from the various processes generating more pressing threats to whales, ocean ecosystems and climate. Focusing on the role of whale poo in dealing with climate change can be considered a ‘securitising’ move. Whales become a vital part of ‘the solution’ to the ‘ultimate threat’, with the implication that the only path forward is whale preservation. This has the potential to conceal any negative aspects of anti-whaling campaigns, which in the past have been criticised for being imperialistic in nature. 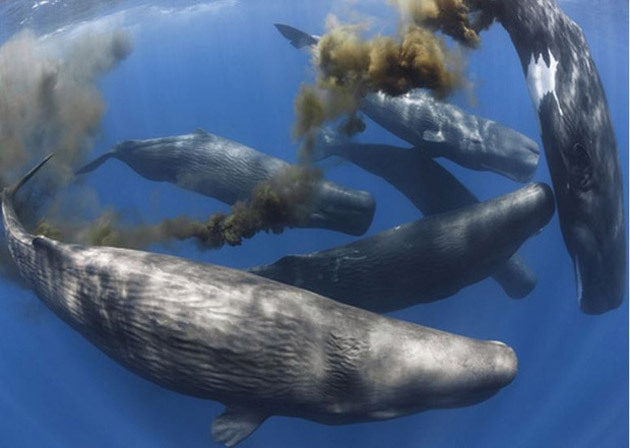 Indeed whaling groups generally expend considerable energy attempting to show their activities are sustainable, the possibility of which is seemingly excluded in the whale poo video. As such, in this video, the superwhale is employed to hide the highly political battles that exist around whale conservation. In sum, this video can be seen as an attempt to use the superwhale narrative as part of the efforts to mitigate climate change. In doing so, an argument for (super) whale conservation is also articulated. Political discussions about modern society’s relationship with the environment are consequently concealed. The challenge is whether better knowledge on whale poo will help to move away from unproductive political conflicts or, instead, it will contribute to reinforce them as the use of the superwhale narrative seems to indicate. *Benedict Singleton is a PhD student in environmental sociology at Örebro University in Sweden. He is currently conducting a research project on ethical discussions within marine mammal science. In addition, he conducted 3 months of research in the Faroe Islands in 2014 on the driving of whales for meat. He is not affiliated with any pro- or anti-whaling groups. The author would like to thank Lau Øfjord Blaxekjær for his constructive comments. “Recent scientific research on marine mammals has created a growing body of knowledge about whale toilet habits. Simplifying greatly, whale movement between the depths of the ocean (where they feed) and the surface (where they excrete) has many positive environmental effects, such as recycling nutrients within various ecosystems.”,Nice article.Thanks for creating awareness.